Poured into a 13 oz Weyerbacher tulip glass canned on 11/08/18. Pours like a glass of pineapple juice with a half inch sticky white head that leaves thin spotty lace behind. Smell guava, papaya, pineapple, a tad dank, and grapefruit. Taste follows tropical all the way, a little weedy and grapefruit in the finish. Mouthfeel is a big medium, soft on the palate, not dry, and amazing drinkability and balance. Overall this is what I expect out of Foam, just an utterly amazing NEDIPA. From a 16oz can, dated 11/08/18. Served in a spiegelau-style IPA glass. Pours a thoroughly murky, dull orange with two-plus fingers of fluffy, puffy, creamy head. Retention is just about meh but leaves a solid fizzy cap and spotty lacing. A faint-to-moderate nose of your tarter tropical fruits, kiwi, papaya, guava, orange peel; that sort of thing. Taste is in line with the nose, tart and zesty with some citric bitterness. Kiwi, clementine, lime, bubblegum and peachy yeast with a fair balance of toasty, biscuity malt. Earthy, fruit-juicy, a touch of catty dankness, decent bitterness, a little sour booziness at the finish. Feel is juicy and refreshing, medium bodied and brightly carbonated. It takes a while to notice but tingly, spicy hop oils build up on the tongue over the course of the drink, finally needing a cracker to scrape them off at the end. Overall, nice. In fact, damnfine. I can't imagine how much even finer it would be if it were 90° and I were outside on the lawn instead of it being a million below and me huddled in front of the woodstove. Anyway... Virtually indistinguishable from Alter Ego except the base here is a little heftier with a toasted-almost-charred maltiness missing from the Tree House brew. Pours a perfect light cloudy yellow, but minimal head and lacing. Nose is amazing with lots of pineapple and papaya/citrus. Taste i get a lot of pineapple and some stone fruit, which turns to a citrus/bitterness at the end, and it leaves a bit of stickiness on the tongue. Feel is that great kinda thick New England Ipa style but slightly sticky finish. Great ipa, but slightly bitter at the end and a little sticky. The taste is great though and reminds me a lot of 'very hazy' with that juicy fruit taste. Pours an opaque, bright gold color with a 3 finger fizzy biscuit-colored head that settles quickly down to a film. You can hear the fizzing on the initial pour, so seems plenty effervescent. The nose is densely packed with guava and tangerine notes, some earth notes, with a zesty tang to it. Intense and very enticing. The taste starts off a little watery with brilliant tangerine notes - not what I was expecting from a seemingly thick NEIPA, but a pleasant surprise. The flavor is really a lightly sweet blend of citrus and guava and a touch of earthy must that comes out most in the finish. There is a moderate bitterness that balances off nicely the light, effervescent orange-ade feel of this one. It is more watery seltzer than soft feel, which is the most surprising aspect of this beer. For a DIPA this has no alcohol burn at all - something I have found Foam does remarkably well at. As someone who does not like the burn I am endeared to this brewery now and may actually seek out their DIPAs rather than buy around them. Foam seems to be establishing themselves as nuanced magicians at this NEIPA thing. I tried 6 others of them at the bar recently and loved all of them - something I can't say about most other breweries focusing on this style. They are a must-get in New England I think. Wonderful New England style dbl IPA. I gotta be thinking that Foam has to be a destination brewery. I can make a case for up there with Trillium and Treehouse. Not on par yet and maybe never but what I have had from Foam compares. 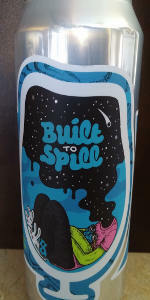 This Built to Spill is superb. I am not good at all the ratings with individual stuff. I just know when I have a decent beer, or a good brew and certainly when I have a a mouth feel and taste like this. Exceptional. I just wish I lived in the area and am great full for a friend who brings me some when he visits me in Maine. First sip was just meh, but as this opens up it.is truely amazing. There is a more floral note than you see in many NEIPA and an acidy that enhances the citrus hop notes. Really brilliant.combination.